We are Brewery Rickoli, the premiere brewery in Wheat Ridge, Colorado, serving freshly brewed craft beer and offering a relaxed and friendly space to gather. We are located by the Southwest corner of 44th Ave. and Wadsworth Blvd. Our take on beer is simple: use great ingredients and brew for flavor! Rickoli’s respects the liquid in the glass and wants to help elevate beer to a refined drinking experience. That’s why we use the finest ingredients and brew in a leisurely manner. The beer tells us when it’s ready. We refuse to be a slave to production deadlines. Wheat Ridge Colorado is a laid back community just west of Denver with easy access from I-70. Wheat Ridge was one of the few remaining enclaves along the Front Range without a craft brewery; but we changed all of that in November 2012! We are dedicated to providing our local neighborhood with a place to sit back with good friends and have a pint close to home. Our brewmaster, Rick Abitbol, has been professionally brewing award-winning beers along the Front Range for over a decade. 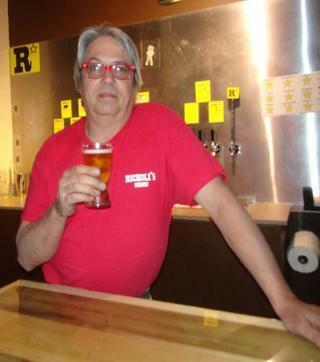 Rick is respectful of beer styles and traditional brewing technique, however, he has long been an innovator of style and not afraid to color outside the lines. He was one of the first brewers to explore the Black IPA, which has become a mainstay in breweries and competitions alike. We love our hops! That’s not to say you won’t find any wonderfully malty creations on tap. There are many, but what you will notice is the variety in our hoppy selections. And always be on the lookout for Rick’s newest creations. In addition to brewing some mighty tasty beers, we also remove the gluten from all of our brews. We believe in making great craft beer more accessible to everyone, so we use an enzyme to reduce the gluten in our beers to under 10 ppm. We take great pride in our brewery and our taproom. Please swing by and check it out for yourself. Grumblers 32 oz. Same shape, smaller size. Washing a Growler is EASY! But only if you do it right after you pour yourself that last beer. All it takes is a couple of rinses of HOT water then turn it upside down in your dish drain. No Soap please, it’s harder to rinse out than beer. As you may have noticed we fill a lot of growlers here at Rickoli's, most of those fills are actually refills of growlers you bring back in to us. Purchase a growler of one of our amazing brews. Enjoy the beer within 24 hours of opening, and when finished, thouroughly rinse the growler out with hot water, including the cap. When and only when completely dry put the cap on and return to Rickoli's for a refill of your new favorite brew. We will give the growler a quick sniff and if it passes we will gladly fill it for you. If it smells a little funky we may gently tease you and discuss the science project you’re conducting in your growler. And we may charge you an extra buck to wash it. This way we can all be sure that our fresh tasty beer goes into a clean growler. And you can experience your favorite Rickoli's brew anytime.